Geboren in 1960 te Delft. Woont en werkt sinds 1973 in Maastricht. 1978-1983: Stadsacademie voor Toegepaste Kunsten Maastricht (Monumentale vormgeving); 1983-1986: Tehatex (1e gr docentenopleiding), scriptie "Is de bauhauspedagogie nog actueel? "; sinds 1991: docent kunsttheorie; 2003-2008: opleidingscoördinator propedeusefase ABKM; sinds 2008: opleidingscoördinator autonome beeldende kunst ABKM; sinds 2009: onderzoeker lectoraat autonomie & openbaarheid in de kunsten - "See what happens" onderzoek naar de werking van Non Places als metafoor voor innovatie in het Maastrichtse beeldend kunstonderwijs; 2011: medeoprichter open source urban campus - O.S.U.C; Beeldend kunstenaar, werkt samen met Tineke Kambier (fotograaf). What kind of Europe are we actually referring to? Is it the Europe of Brussels, Paris, Berlin, The Hague, Maastricht? 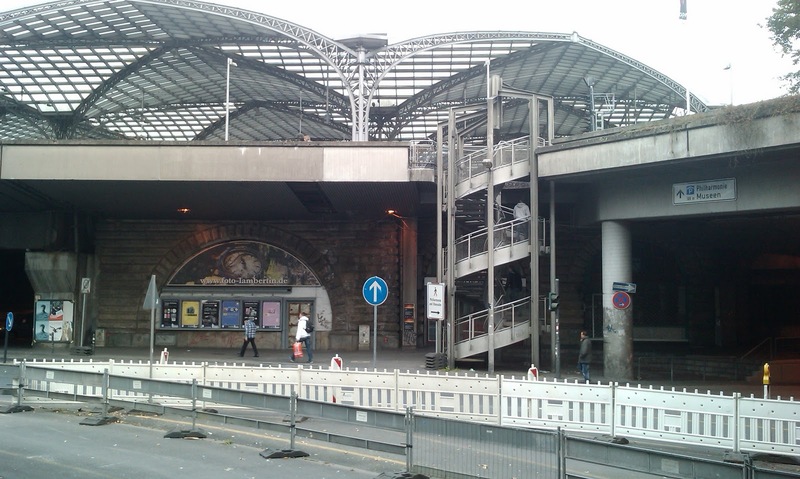 In other words, does Europe boils down to the success stories of assuming cities and regions ? Do these regions benefit from the fact that people believe in the idea of Europe? Is this what city marketing is all about? Let me get this straight: I am very interested in Europe’s development and I find it very challenging to witness the having become obsolete of the old borders and the redrawing of new borders. But this is a different Europe altogether. This is the Europe of Sarajevo, Calabria, Bari, Marseilles, Calais, Tirana, the Paris agglomeration, Potsdam, Wallonia, the Belgian mining district of the Borinage, the south-east Limburg mining district. In short, this is a Europe of slimming down, of demarcations (beyond the Schengen Treaty), new small-scale economies, ageing populations, of things intercultural, and of revaluing the notion of shrinkage. This is the Europe of transition, a no man’s land, fraying at its edges. Would you not agree that it is much more attractive and topical than the Europe of the European Union and the Monetary Fund? This call to mind images of desolate spaces in big cities where youngsters loiter and where the feeling of togetherness has engendered new codes and registers. The ‘other Europe’ can offer substantial challenges if it is no longer seen as a problematic area. You could turn the reasoning around: what perspective of the future will come about if we see the problem areas as the new centres of European culture? However, in taking on the challenge I would plead not to turn to the so-called Creative Industry (CI), despite the fact that minister Verhagen has called into being a new fund for innovation for the creative industry, viz. the MKB+ fund (Volkskrant 19th December 2011). As far as I am concerned, it proves that the CI represents the political agenda of official Europe, of neo-liberal market-oriented thinking. An agenda that, in my view, is too one-sidedly focused on annexing problem areas and turning them into official European reserves by using the strategy of old ideas parading as new ones. Ultimately, it all comes down to the principle of gain. In 2001 the French anthropologist Clementine Deliss gave in lecture in the auditorium of the then newly constructed building of the ABKM. She congratulated the audience with the beautiful building drawn by a star architect, with the location at the heart of the economically very appealing heart of the city. Before long, however, the lecture took a unexpected turn when Deliss posited that ABKM had better opted to take up residence in a housing estate at the outskirts of Maastricht. Deliss believed that the concept of the art academy had gone awry because art academies in the 20th century had too restrictedly trained visual artists as visual artists. In her view, the solution was to return to the classic academy model and engage in discussions about the best ways to relate to ‘the World’. Deliss was met with derision. Surely, no one in his or her right mind would claim that such a magnificent building with its outstanding facilities could not anything but beneficial for students? The very idea that the academies would benefit from returning (temporarily or partially) to the classical and basic model was considered ridiculous and delusional rather than exceptionally challenging. Since 2001 much has happened. As a consequence of the crisis and despite all effort Europe is still a far stretch from being perfectly united. The Bologna Treaty is being scrutinized by a growing number of representatives from the world of art education. Due to the crisis the art world has focused on the issue of the identity and role of the artist, independent of political interest in the matter. In short, the theme has been the subject of many articles and the experiments in the field of innovative educational methods are numerous. One instance of an experiment is the Open Source Urban Campus (OSUC). OSUC is not about effective adaptation but about active alienation. This implies that OSUC’s view of art education greatly values positioning next to professionalizing. The very fact of alienation necessitates a positioning. OSUC is a post-academic type of educational that ties in with the training in Fine Art that the Art Academy in Maastricht is providing. Extra muros it queries and studies new artistic practices from constantly changing perspectives. It studies how education should be organized and according to what conditions. OSUC stands for an independent model of training and education that does not start off from the prevailing reality of the Market. Martha Nussbaum’s book Not for Profit: Why Democracy Needs the Humanities (2010) unravels a beautiful argument in favour of this method of approach. The preparations for OSUC happened in the summer of 2011 and were mainly concerned with the exploration of the content and interpretation of the concepts of ‘programme’, ‘equality’, ‘community’, ‘commitment’, ‘open source’. What does it imply to enroll in a training programme that has no established goals and didactic working methods? What does a training look like whose aim it is to deform rather than form, to expose rather than preserve. What does the notion of programme imply? What is an artistic practice? Do the visual arts contain pedagogic and educational functions? How are we to image the idea of equality between student and lecturer/mentor? What is commitment and how far can you go within a non-compulsory educational context? What is open source actually all about? A programme is a ‘prescribed entity’ and creates expectations that in their turn instigate adapted behavior. In the case of OSUC the programme is related to proactive behavior. Equality means that everyone can assess the whole of actions and events that arise spontaneously and that everyone can have their say. Equality is only productive when there is at least some degree of interest present. A community exists when at least two parties share an interest. In that case it also means: shared autonomy. Commitment is a form of self-esteem and appreciation, something that later can be said to have been or not have been present. Is it sufficient for an artist to claim that that he is dedicated to what he is doing? Or does it take more? Open source is a broad concept of which the use and practical ethics have to be accepted by everyone. From 5th October until 2nd November 2011, the OSUC, having 15 participants, resided on a 24/7 basis in two apartment buildings that were to be demolished in the quarter Bleijerheide in Kerkrade. The themes that OSUC has addressed are various. ñ First of all the importance of a place of one’s own (physically and mentally) was discussed in a society that increasingly manifests itself as a no man’s land. A no man’s land becomes ‘native/familiar’ when no questions are posed about identity, when all is met with acceptation/tolerance and a feeling of interest, when a proactive attitude is adopted. ñ Then the question was asked in what way artistic practices can contribute to the revaluation of money, for instance by creating new economies (barter trade) and giving preference to small-scale things. Gradually the artist is accepting the fact that what he does should relate to and be measured by the international artistic field. But what would happen when the production of fine art would focus on, as a small farmer would do, very specific, small-scale, local conditions? ñ What is the importance of knowing one’s own history? ñ What is the importance of the imagination when a situation has occurred in which there is no clear picture of the future? According to Martha Nussbaum, professor of Law and Ethics at the University of Chicago, art is part of the humanities and in that sense it plays an important role in democracy. Art is important in order to deal with the notion of durability in a meaningful way – the usefulness of a set of ideas, for example, and the durability of our surroundings. ñ Is fine art an escape from reality or, conversely, can art provide insight into reality? ñ How does art relate to the experience economy? Is authenticity but an illusion? ñ What technologies can artistic practices apply without becoming dependent of them? ñ How do artistic practices help people become critical citizens? ñ In cities complex processes are unfolding and these processes will only increase, be they processes of growth or reduction. There is much left untouched in these processes that can be of interest for artistic practices, that can help establish new meanings and gain new insights. Kerkrade offered a local perspective on European issues and the OSUC made clear that instances of a no man’s land are unique levers, test cases for new artistic practices, the forming of (temporary) alliances and, last but not least, innovation in education. When taking a closer look at Europe from the perspective of OSUC and Kerkrade, education is no longer directly associated with adaptation (effective professionalization) but with active alienation (positioning). In an environment of that nature, art education does not provide ‘formation’, but rather ‘deforms’. It does not protect, but opens up to the many and various aspects of public things. OSUC does not train young people to become visual artists in the confines of the art world, but makes them into critical citizens that produce art, but also relate to the world through their art. 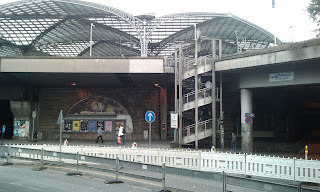 This type of Europe offers unique opportunities to establish new art practices that produce things that no longer tie in with the old principle of haves vs. have-nots, but adhere to the new principle of aware vs. unaware and that show the importance of generating critical, independent views. This is what Europe and the Euro is badly in need of. See What Happens is een bundeling van persoonlijke ervaringen, notities en ideeën die ik sinds september 2009 heb verzameld en gebundeld en die is voortgekomen uit de persoonlijke vraagstelling naar hoe artistieke praktijken zich verhouden tot het beeldend kunstonderwijs en omgekeerd. In de kunstwereld worden al sinds het eind van de jaren ’90 voorstellen gedaan om tot een herpositionering van het fenomeen kunstacademie te komen, en daarmee tot een herpositionering van artistieke praktijken in relatie tot de sociale werkelijkheid. Wat mij opvalt is dat het kunstonderwijs hier tot nu toe nauwelijks op heeft gereageerd. Sterker nog: Na het Verdrag van Bologna (1999), waarin wordt bepaald dat het onderwijs in Europa onderhevig is aan de zogenaamde bachelor-masterstructuur (BaMa), een gelijke uitwisselbaarheid van studiepunten en een on going programma van internationale uitwisselingen (ERASMUS), lijkt het er op dat het kunstonderwijs geen instrument meer is, maar een doel op zichzelf. In de Volkskrant van 23 december wordt gewag gemaakt van een nieuwe term die een rol zou kunnen spelen bij de zoektocht naar het verband tussen kunst en sociale realiteit. Die term is precarity, voor het eerst in deze context gebruikt in 2007 ten tijde van de protesten voor arbeidsrechten in Parijs. Precarity betekent zoiets als ‘structurele onzekerheid’. Zekerheid is een illusie. Er is maar een zekerheid, verder is het leven precair, gezondheid is precair, de natuur, de liefde, werk, pensioenen en carrière. Dit vraagt om een constante alertheid, flexibiliteit en de noodzaak van het zonder omhaal ergens aan durven te beginnen, zonder dat de uitkomst daarvan met zekerheid succesvol kan worden genoemd. En dat is precies waar de kunst haar kracht uit put! Daar zou kunstonderwijs zich dus m.i. op moeten richten! Het onlangs verschenen boek Niet Voor de Winst van Martha Nussbaum vormt een prachtig argument voor een dergelijke benadering. Op deze thema’s gaat het eerste deel van See What Happens in, en verwijst naar een aantal voorbeelden die precarity als uitgangspunt van het beeldend kunstonderwijs alleszins legitimeren. Het tweede deel gaat in op een onderwerp dat mij in mijn artistieke praktijk bezig houdt en dat ik deel met mijn partner in crime, de fotograaf Tineke Kambier. Dat onderwerp richt zich op de vraag hoe niets ‘iets’ kan worden. Daarbij hebben we het beeld van de ‘niets’-plek voor ogen. werking van niets-plekken en non places te bestuderen: dat werd Los Angeles. In mei 2010 verbleven we daar en in het kleurenkatern van de publicatie zijn foto’s terug te vinden van Los Angeles River die een metaforische werking hebben op de tekst. In het laatste deel Let’s talk about reality, probeer ik mij een voorstelling te maken van hoe nieuwe artistieke praktijken er uit zouden kunnen zien. Met andere woorden: waartoe worden jonge mensen anno 2012 opgeleid? Wat gebeurt er bijvoorbeeld met artistieke praktijken als zij zich niet langer per definitie tot de kunstgeschiedenis verhouden maar worden blootgesteld aan verschillende noties van sociale politieke en economische werkelijkheid? Wat gebeurt er als ze zich niet langer verhouden tot het oude model van de kunstmarkt (have not have), maar tot democratie (aware - unaware)? Piero Golia (Mountain School of Arts) I don’t believe in planning, i feel very weird about people and mainly artist being sure about what they do and why they do it. If you know everything already to me it seems like you just playing a script. It’s just fiction, it’s not reality. I love reality. Door middel van een aantal voorbeelden wordt duidelijk dat dergelijke uitspraken niet op zichzelf staan maar liggen ingebed in een reeks van initiatieven die aantonen dat experimentele vormen van kunstonderwijs al lang bezig zijn de sociale werkelijkheid open te schoffelen en steeds meer gericht zal zijn op het vinden van thema’s die geplaatst kunnen worden buiten de dominantie van de markt. De focus is daarbij gericht op de verschillende aspecten van ‘professionalisering’, maar vooral ook op de ‘positionering’ van de beeldend kunstenaar als kritische burger in een complexe wereld. In dat verband is See What Happens geen verzuchting in de zin van “We zien wel wat er van komt…”, maar het is een betekenisvolle grondhouding voor het vormen van artistieke praktijken. Wat ik me daarbij voorstel staat in mijn besluit van See What Happens. Lyanne Polderman en Sven Franzen, beiden alumni van de opleiding visuele communicatie, sluiten met hun vormgeving aan bij de thematiek, doordat ze onophoudelijk typografische grensgebieden, rafelranden en ‘niets’-plekken creëren en keuzes maken voor lettertypes die een contrasterend beeld oproepen ten opzichte van wat je ‘gangbare’ vormgeving zou kunnen noemen. De foto’s van Tineke Kambier scheppen een metafoor ten opzichte van de tekst. 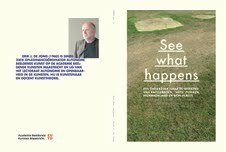 See What Happens is voor 15 euro verkrijgbaar bij Boekhandel De Tribune, Marres Bookshop en bij Out of Storage in de Timmerfabriek, allen te Maastricht, bij Stedelijk Museum `Het Domein´ in Sittard en Kunstcentrum Signe en Glaspaleis ´Schunck´, beiden in Heerlen. Via de ABKM (contact verena.lukas@zuyd.nl) kan See What Happens kunnen worden toegezonden. De kosten bedragen dan 17 €. OPEN SOURCE URBAN CAMPUS - O.S.U.C. Een van de concrete voorstellen die inmiddels uit het onderzoek naar de werking van Non Places als metafoor voor innovatie in het beeldende kunstonderwijs in Maastricht zijn voortgekomen, is de realisatie van een Open Source Urban Campus – O.S.U.C. in de regio Maastricht / Heerlen. In oktober 2011 zal de pilot plaats vinden en in de zomer van 2012 zal het eerste officiële traject in gang worden gezet. Kerngedachte van de O.S.U.C. is de noodzaak van positionering. Let’s talk about reality is een uitnodiging om de vele vragen naar de positionering van artistieke praktijken in een complexe sociaal-politieke werkelijkheid aan de orde te stellen en tot nieuwe opties door te dringen. Daarnaast is het een oproep om kritisch onderzoek te doen naar de vraag wat een artistieke praktijk eigenlijk is, en naar de mogelijke relaties tussen de verschillende artistieke praktijken, verschillende contexten van kennisoverdracht en curatorial practices. Een tijdelijke situatie waarin weinig tot niets van tevoren is georganiseerd lijkt de beste condities te bieden om de uitdaging aan te gaan en daadwerkelijk tot uitspraken te komen die van tevoren niet konden worden bedacht. Zo bezien krijgt educatie haar letterlijke betekenis weer terug, namelijk die van ‘bloot stellen aan’. Van 23 tot en met 26 mei 2011 werd een tweede studiereis ondernomen naar MAXXI in Rome, met als doel een ontmoeting te hebben met de Italiaanse Arte Povera kunstenaar Michelangelo Pistoletto (1933) en hem vragen te stellen in verband nieuwe artistieke praktijken in relatie tot innovatie van het kunstonderwijs. In MAXXI was een overzichtstentoonstelling te zien van het oeuvre van zijn vroege oeuvre van en van zijn laatste grote project: Cittadellarte (1998). Cittadellarte is een interdisciplinair kunstinstituut dat is gevestigd in een oud fabriekscomplex in Biella (Noord Italië). Het werd in 1998 werd opgericht. Net als bij Calarts wordt ook bij Cittadellarte de vraag naar ideeën voorop gesteld en niet zo zeer de vraag naar welke media of voorkennis een kunstenaar of kunststudent beheerst of zou moeten beheersen. Cittadellarte-Fondazione Pistoletto werd opgericht als onderdeel van The Progretto Arte Manifesto, waarin Michelangelo Pistoletto een nieuwe rol van de kunstenaar voorstelde. Deze nieuwe rol zou zich vooral moeten richten op het creëren van de directe interactie tussen kunst en all the areas of human activity which form society, en gedraagt zich als laboratorium en generator van creatieve energie, aanjager van niet officiële en onverwachte ontwikkelingsprocessen op het gebied van cultuur, productie, economie en politiek. “Art is the most sensitive and complete expression of thought and it is time for artists to take upon themselves the responsibility of ensuring communication between all other activities, from the economy to politics, to science and religion, through to education and behaviour. In other words, all aspects of the social fabric”. Cittadellarte is georganiseerd in de vorm van verschillende ‘kantoren’, de zgn. Uffizi. Ieder afzonderlijk kantoor adresseert een specifiek gebied in het sociale systeem, met als belangrijkste doelstelling: de transformatie van een globale samenleving, te beginnen bij de locale dimensies (kleinschaligheid). De Uffizi zijn onderverdeeld in verschillende categorieën: kunst, educatie, ecologie, economie, politiek, spiritualiteit, productie, arbeid, communicatie, architectuur, mode en voedsel. 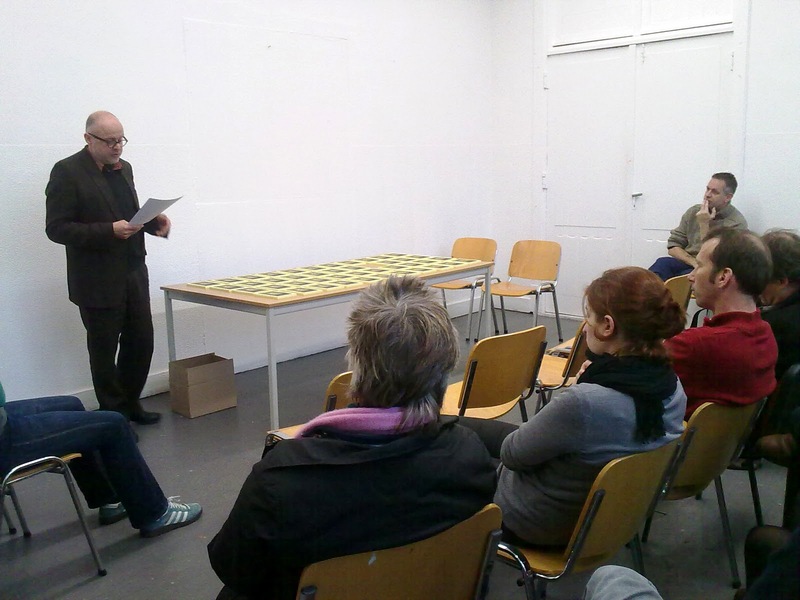 In 2010 organiseerde de Fondazione Pistoletto de tentoonstellingen “Practicing Memory in a time of an all-encompassing present” en “VISIBLE – where art leaves its own field and becomes visible as part of something else”. Beide zijn voorbeelden van de wijze waarop Cittadellarte onderzoekt hoe productieruimte (lees: atelier) en tentoonstellingsruimte gezien kunnen worden als sociaal en educatief forum, met ingrijpende gevolgen voor de positionering van de kunstenaar. Hij is niet langer een superindividueel genie dat meesterwerken maakt en zich zodoende alleen tot zichzelf en de kunstgeschiedenis verhoudt, maar hij wordt iemand die samenwerkt en zijn kunst niet zo zeer meer ziet als meesterwerken, maar als instrumentarium. 06 t/m 17.05.2010: studiereis naar Los Angeles i.v.m. onderzoek naar de werking van non-places als denkmodel voor innovatie binnen het kunstonderwijs. Als beeldend kunstenaar ben ik altijd geïnteresseerd geweest in situaties, ruimtes, objecten, teksten en afbeeldingen die van zichzelf niets (meer) zijn, maar wel een voorwaarde kunnen bieden om van dat niets ‘iets’ nieuws te maken, waardoor nieuwe betekenissen kunnen ontstaan. Niets plekken zijn in mijn besef condities die uitdagen om uitgaande van het ‘niet(s)’ te komen tot een ‘iets’. Als docent heb ik me altijd aangetrokken gevoeld door situaties die in eerste instantie 'niets' lijken te worden, maar doordat verschillende vormen van kennis, vaardigheid en ervaring door elkaar heen gaan lopen (zoals bv 'praktijk' en 'theorie') kunnen er nieuwe perspectieven ontstaan. In 2009 ontstond de gelegenheid om mijn fascinatie voor 'niets'-plekken, niemandsland, rafelranden en Non Places te verdiepen in de vorm van een onderzoek binnen het lectoraat Autonomie & Openbaarheid in de Kunsten (lector Peter Peters) en te streven naar een publicatie over onderwijsvernieuwing in relatie tot nieuwe artistieke praktijken. In 2010 reisde ik in het kader van dat onderzoek met fotograaf Tineke Kambier naar Los Angeles. Niet alleen omdat L.A. om verschillende redenen de Non Place bij uitstek is en er dus een grote artistieke uitdaging lag om dit op verschillende manieren vast te leggen, waarbij we ons o.a. lieten leiden door het Non Plan dat architect Reyner Banham voor Los Angeles heeft ontworpen en door het boek Non Places, an introduction to supermodernity van Marc Augé. Maar ook omdat er interviews in het verschiet lagen met John Baldessari, die binnen het roemruchte CalArts sinds de jaren '60 veel invloed heeft uitgeoefend op het kunstonderwijs, en met Mathew Timmons (gastdocent critical studies) en Thomas Lawson (coördinator beeldende kunst) van datzelfde instituut. Tenslotte waren er ook afspraken gepland met o.a. Piero Golia, een van de oprichters van The Mountain School of Arts (2005), een onafhankelijk experiment op het gebied van kunstonderwijs, en Miljohn Ruperto. Tijdens het bezoek aan CalArts was de centrale vraag gericht op hoe men omgaat met aanname en selectiebeleid, toetsing en beoordeling en de relatie tussen kunstenaar/docent en student in een leeromgeving waar ‘complete freedom of creativity’ en ‘free will’ voorop worden gesteld. Er werden gesprekken gevoerd met Matthew Timmons (coördinator van Critical Studies – critcal writing/aesthetics and politics), Thomas Lawson (coördinator van Art School, Film & Video), John Baldessari (legendarisch CalArts-docent), Valerie Green (MFA-student), Jenny Gondo (BFA-student) en er werd een aantal studiovisits afgelegd. The Mountain School of Arts werd in 2005 opgericht door Piero Golia en Eric Wesley. De naam roept wellicht associaties op met het roemruchte Black Mountain College. En hoewel ook daar, net als bij MSA, het scheppen van ‘community’ een van de belangrijkste condities is, heeft het volgens de oprichters niets met elkaar te maken. Het MSA is drie maanden per jaar geopend en is gevestigd in een bar in het hart van Chinatown Downtown L.A. Lezingen worden gegeven op het dak van de bar. Het MSA probeert een encyclopedisch programma te bieden en het liefst niet te focussen op kunst en al helemaal niet op contemporaine kunstvormen. Alles bepalend is de vraag naar de werkelijkheid waar iemand zich in bevind en wat er nodig is om die te begrijpen. Kunst is alleen een instrument waarmee je dat begrip kunt tonen en waarmee je commentaar kunt leveren. Er werden gesprekken gevoerd met Piero Golia en Miljohn Ruperto (alumnus MSA) over de vraag waartoe je kunstenaars in het huidige tijdgewricht zou moeten opleiden. Hoe zou kunstonderwijs zich moeten verhouden tot het innemen van radicale posities? En wat is het verschil tussen alle tijdelijke en nomadische academies die beeldend kunstenaars, critici en curatoren de laatste jaren over de hele wereld in verschillende vormen hebben opgericht en het MSA dat inmiddels vijf jaar bestaat? Piero Golia ziet het MSA als ‘een echte school’ en niet als een persoonlijke event of performance. Hij heeft het niet alleen over overgave en onvoorwaardelijk commitment, maar ook over presentie, voorbereiding en verantwoordelijkheid. En het gaat hem wel degelijk om een geconcentreerde en opzettelijke intellectuele ruilhandel, het uitwisselen van kennis en kunde, het emanciperen van identiteiten en het verschaffen van bijzondere inzichten en vergezichten, en het scheppen van een uiterste sensibiliteit voor de werkelijkheid waarin iemand zich bevindt om daarmee ‘iets’ te maken. Deze zoektocht naar intensiteit kan worden volgehouden omdat het programma maar zo kort duurt. Wat een eerste vergelijking duidelijk maakt is het grote verschil tussen interdisciplinariteit, een van de centrale issues van al het onderzoek dat binnen het lectoraat gedaan wordt. Enerzijds wordt het gezien als een opzettelijke conditionering die voortdurend cross-overs mogelijk maakt tussen de disciplines, en daardoor vooral binnen de kunsten dynamiek genereert (CalArts). Anderzijds is interdisciplinariteit bij het MSA vooral een open ended situatie waarbinnen vragen worden gesteld die leiden tot nieuwe vormen van sensibiliteit, en dus niet zo zeer leidt tot cross-overs tussen de traditionele disciplines, maar tot nieuwe kunstpraktijken (disciplines).